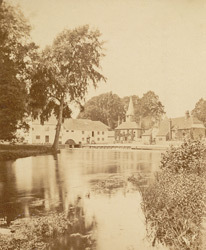 "The view of Whitchurch shows the Old Mill, and behind, the simple spire of the village church. Pangbourne, on the opposite bank of the river, has a railway station, which makes the twin villages easy of access from London...The reach above Whitchurch is a very beautiful part of the river. The hills on each side are high and richly wooded, and the grounds of Basilden Park especially are very attractive."